New proposals for Gosforth High Street have been released by Newcastle City Council today. These proposals include pedestrian-priority crossings on side streets, revised parking arrangements and a reduced speed limit. 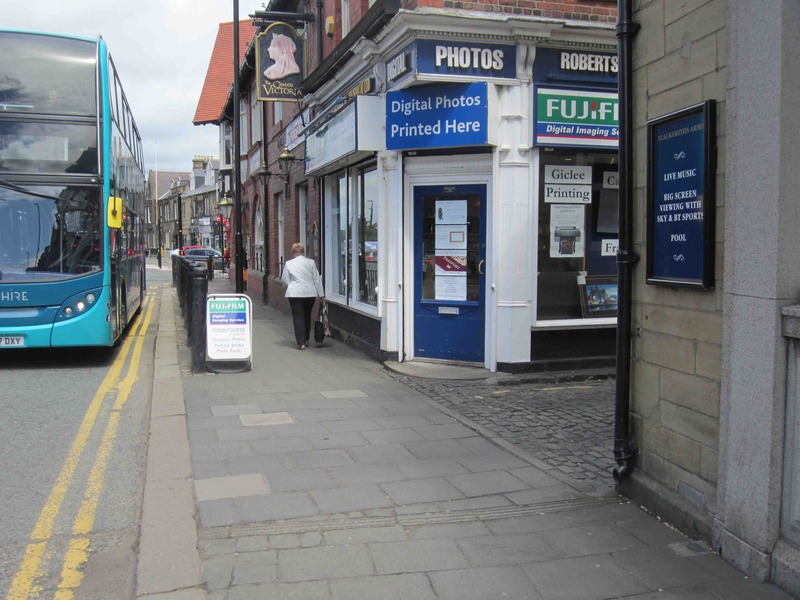 While the ‘Red Route’ plans are still officially on the table, the Council has agreed to work with SPACE for Gosforth and local business owners to see if alternative approaches can be found that address issues such as the High Street’s poor safety record, air quality and traffic congestion, and which will help make Gosforth High Street an attractive and vibrant destination that people want to visit. The proposals released today, which we describe below, are the first step in this process. The proposals have been released for ‘technical consultation’ which means any feedback needs to be submitted to the Council to be considered, but we would like to know what you think as well. We have included links to the plans and press release at the end of the article. Raised crossings will be familiar to most people who use the High Street, in particular the raised crossing at the end of Ivy Road opposite Sainsbury’s. 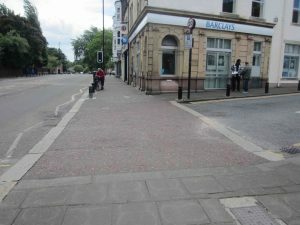 This allows people to cross the street without having to go up or down at a kerb, which is easier for people with wheelchairs or buggies. The crossing also acts as a speed bump to slow turning traffic. While Ivy Road is a raised pedestrian crossing it does not, unlike Causey Street further south, appear to give priority to pedestrians. The indented kerbline directs drivers into Ivy Road, while the presence of road markings right at the junction and the double yellow lines running through the crossing both indicate a road rather than a place where pedestrians have priority. In contrast, at the crossing of Causey Street the kerb line continues in line with the pavement and road markings do not enter the pedestrian area, indicating to drivers that pedestrians should have priority at this crossing. On the other side of the High Street there are some existing pedestrian priority crossings that you might not even have realised are crossings. Just next to The County is the entrance to Roseworth Terrace. It should be clear to any driver here that when they cross the pavement they need to give way to pedestrians, just as if they were exiting their own drive at home. 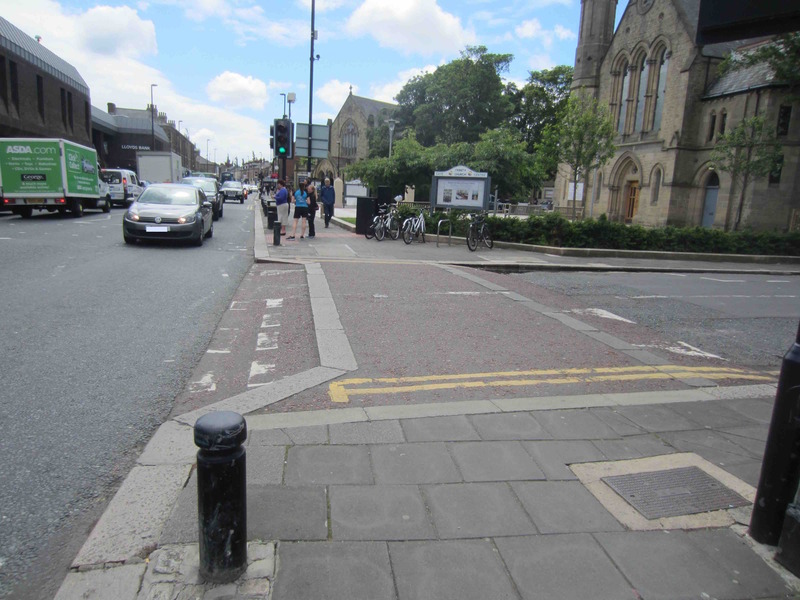 At the north end of the High Street is another entrance, to the Gosforth Memorial Medical Centre, that again has continuous pavement. 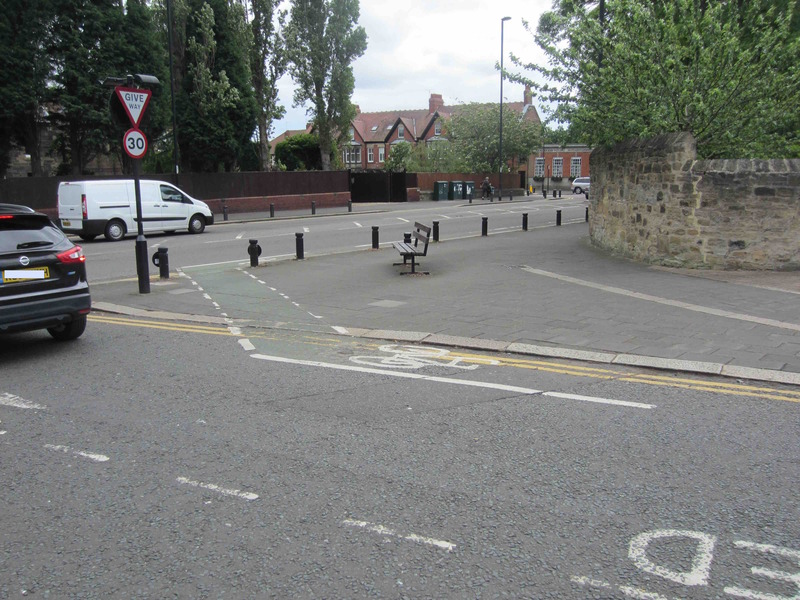 You can also see this design of crossing where Back Grove Avenue meets the High Street just opposite Elmfield Road. 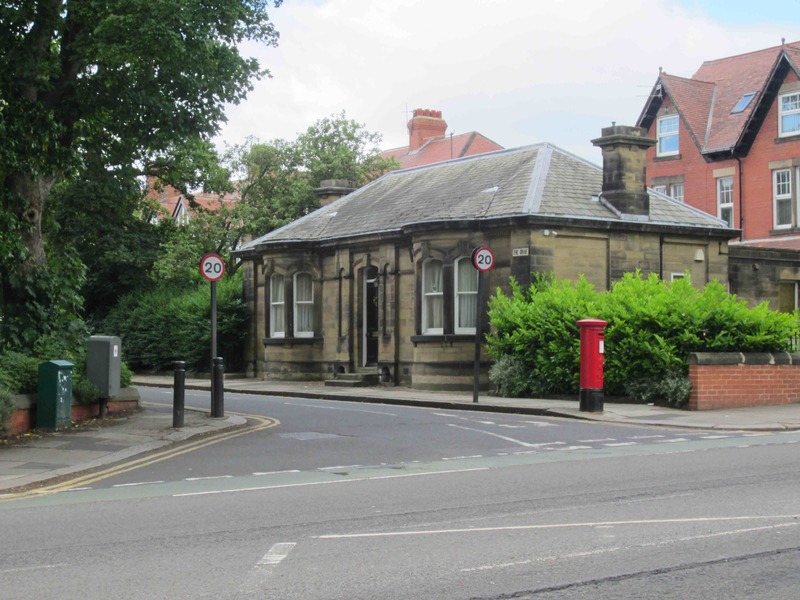 The proposal includes new pedestrian-priority crossings at Elsdon Road, High Street Back, West Avenue, Hawthorn Road, Elmfield Road, The Grove, Graham Park Road, The Poplars, The Drive and Moor Crescent as well as at the entrances to the Salters Road and St Nicholas Avenue car parks. Although we have information on road traffic casualties for these junctions, we are still interested to know your experience of using these crossings. Do you feel safe? Where have vehicles given way to allow you to cross? 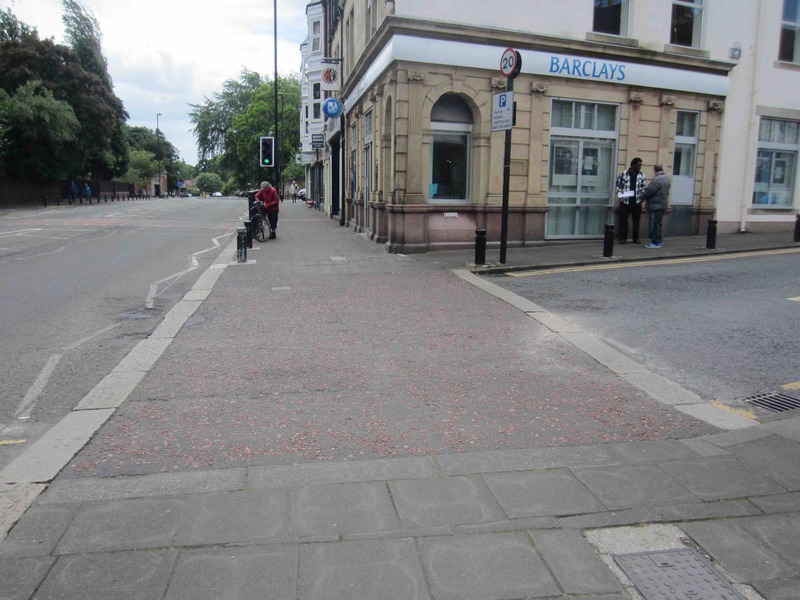 Would more of these crossings help make the High Street more pedestrian-friendly? There is one further option that is not included in the current proposal. That is the junction between the High Street and Woodbine Road where through traffic has been removed and pedestrians have complete priority. Another important factor for pedestrian comfort and safety is the width of the crossing. Having a wide ‘splay’ at the end of the street means the street takes longer to cross, leaving a pedestrian vulnerable for longer, while also allowing cars to maintain a higher speed when turning, making any injuries sustained in a collision more serious. Narrowing the street ends reduces the time people need to cross, improves visibility and reduces the speed of turning vehicles. All these make it safer for pedestrians by making it less likely that a pedestrian would be hit by a vehicle and by reducing the likely severity of any injury if they are. The roads where narrowed entries are proposed are The Drive, The Poplars, Graham Park Road, The Grove and the entrance to the St. Nicholas Avenue car park. 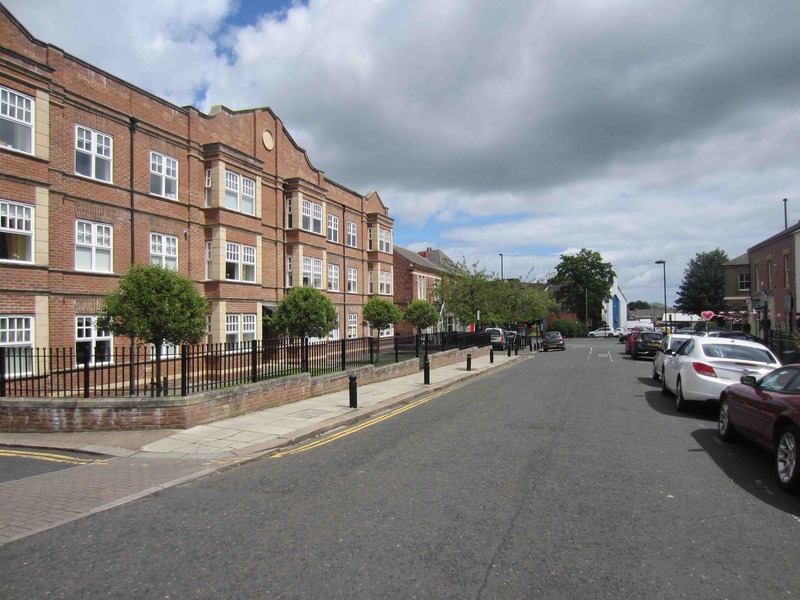 If you look at Causey Street and Ivy Road you will notice that the splay is very small – the width of these streets where they meet the High Street is virtually the same as the width further along the road. Compare this to The Drive where there is a large cut out on the South side that currently forces pedestrians to cross away from the normal desire line / most direct route. 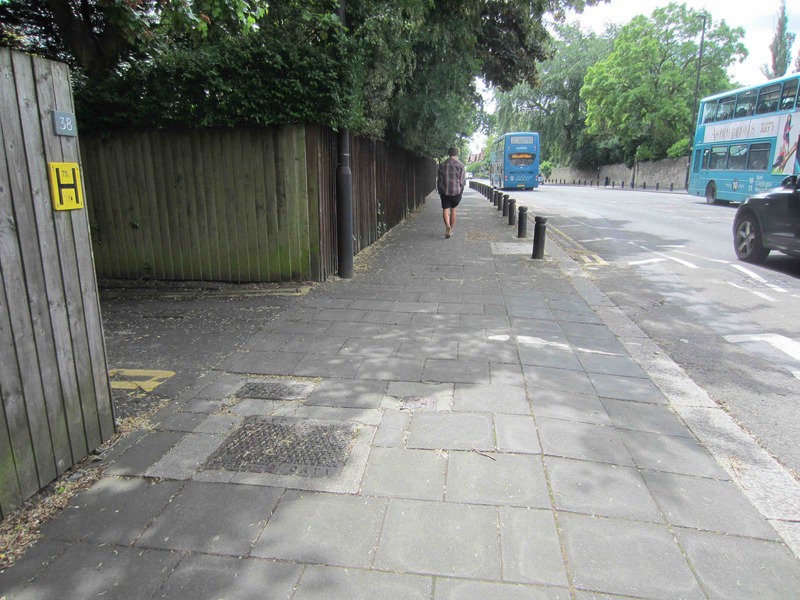 At Graham Park Road the splay makes it harder for people wanting to cross to see approaching vehicles. Walking in the direction shown in the photograph below, you have to walk to the bollard on the right of the picture before it is possible to see vehicles approaching from Graham Park Road. At that point, it is harder to see vehicles that might be turning from the High Street. This also means that despite having a raised crossing most people do not use it. At The Poplars, the current crossing is almost twice as wide as the width of the road. It is worth noting that even with a narrowed entry it will still be possible for bin lorries and other larger vehicles that need to access these streets to do so, though in some cases they may need to make a wider turn. 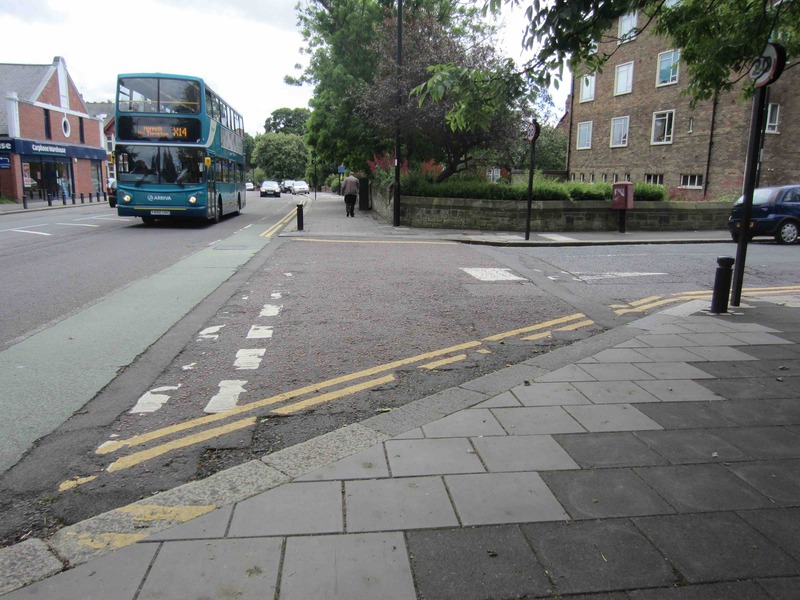 Another part of the proposal is to relocate the Elmfield Road Cycle Bypass (pictured below). The current location has the cycle route crossing exactly the same space as where pedestrians wait to cross Elmfield Road. Moving this slightly further away from the corner will remove this conflict while still allowing cyclists to turn into this road from the south. Amending current spaces outside Loco (the post office) on Ivy Road and at the end of Salters Road to be short stay making it easier for people to ‘pop in’ to these shops by car. Removing some no parking restrictions on Woodbine Road, West Avenue and Hawthorn Road to create additional spaces (see below for details). These additional spaces are all proposed to be for a maximum 2 hour stay with no charge. New yellow lines on the north side of Salters Road and at St Nicholas Avenue where it joins Church Avenue (near South Gosforth Metro). 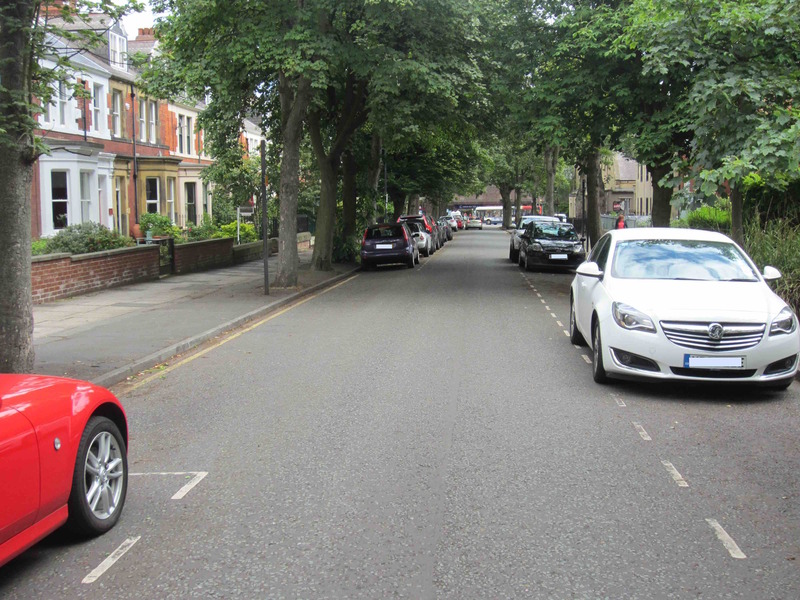 Whilst SPACE for Gosforth has some concerns about allocating additional parking spaces in residential streets and the potential for some extra traffic on those streets as a result, we understand that these proposals will have a much reduced impact compared to the changes approved with the Red Route scheme. We hope that the residents of the streets involved will engage with this consultation to share their view on these proposals. On Hawthorn Road the proposal is to replace the yellow line on the left of the picture with parking spaces, with some further spaces created in the back lane just visible on the left of the picture. On West Avenue the yellow line pictured on the left below will be replaced by residents parking and a number of residents’ spaces at the end of the street nearest the High Street will be rebadged as 2 hours only (currently these spaces can be used by residents as well as shoppers). On Woodbine Road some of the yellow line next to the Old Chapel will be replaced by parking spaces. If you wish to respond on the parking changes you may wish to consider who the parking is for (shoppers, residents, disabled, loading for businesses etc. ), what the waiting restrictions are (e.g. 30 minutes, 1 hour, 2 hours), when those restrictions apply and whether the spaces should be free or a parking charge applied. These parameters will guide the use of the spaces, with shorter waiting and/or higher prices likely to lead to more vehicles being able to use the spaces on any given day, but each for a shorter period. SPACE for Gosforth previously completed a parking survey of spaces near Gosforth High Street in which we counted 1,482 spaces within a short walk of the High Street. A separate proposal on speed limits along the entire length of Great North Road, from the city centre to the A1, has also been released. This will include a 20mph speed limit on Gosforth High Street between The Grove and Salters Road. As we set out in our post 20 mph – the right speed for Gosforth’s children, speed is the key factor both in the likelihood of impact and the consequences if the worst does happen, and that if the speed of impact in a collision involving a pedestrian is reduced by 10mph, the chance of being killed or seriously injured is halved. You can see the proposals described here. The Council have also issues a press release. You can comment on these plans by writing to gosforthti@newcastle.gov.uk. It is just as important to write in if you support these plans as if you have suggestions for how they may be improved. To be sure that your comments are considered you should submit them prior to 25 July 2016. We would like to thank the Council for supporting this approach, Councillor Nick Cott for helping to get the different groups together and Duncan Young, Peter Thorpe and the other High Street traders for also agreeing to give up their time to be part of the discussions. 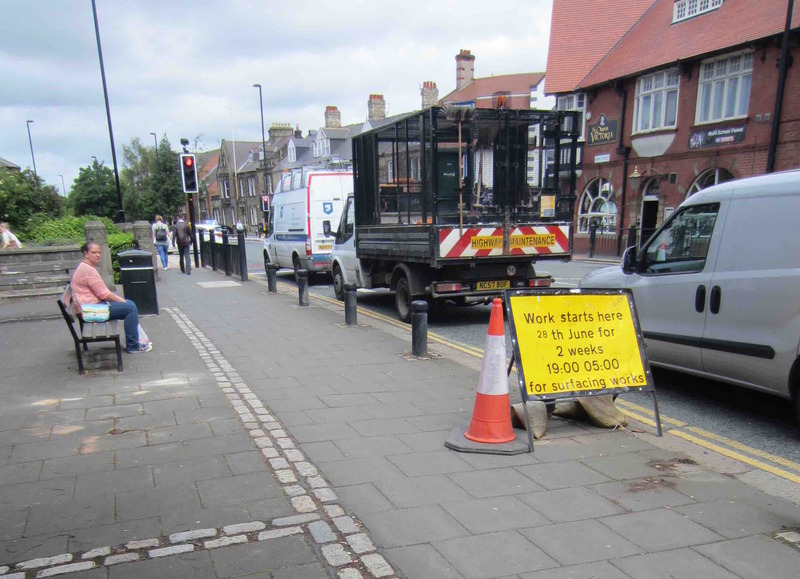 This entry was posted in Disabled, Gosforth High Street, Loading, Parking, Safety, Walking on July 4, 2016 by SPACE for Gosforth. The extra spaces for parking 2 hrs sounds great as a mum of 2 young children i often avoid the high st as i cant get parked near where i want to park. i I genuinely didnt know about the give way to pedestrian paths across roads, and the extra spaces that are going to be created sound great too. The problem is that there is no enforcement of existing 30 mile an hour limits on the High Street and cars regularly shoot the lights on the pedestrian crossings. We need cameras on the High Street! The problem with cars ignoring the red light at the pedestrian crossings particularly at the north end of the High Street is partly caused by buses blocking the view of those lights for the car drivers. Sometimes the lights on both sides of the road are obstructed from view. This does not remove the responsibility of the drivers to stop but if they are travelling too fast they will not be able to. I never just walk across on the ‘Green Man’ now, having seen several such incidents, I always look carefully first. I think this issue needs to be looked at. In 4. 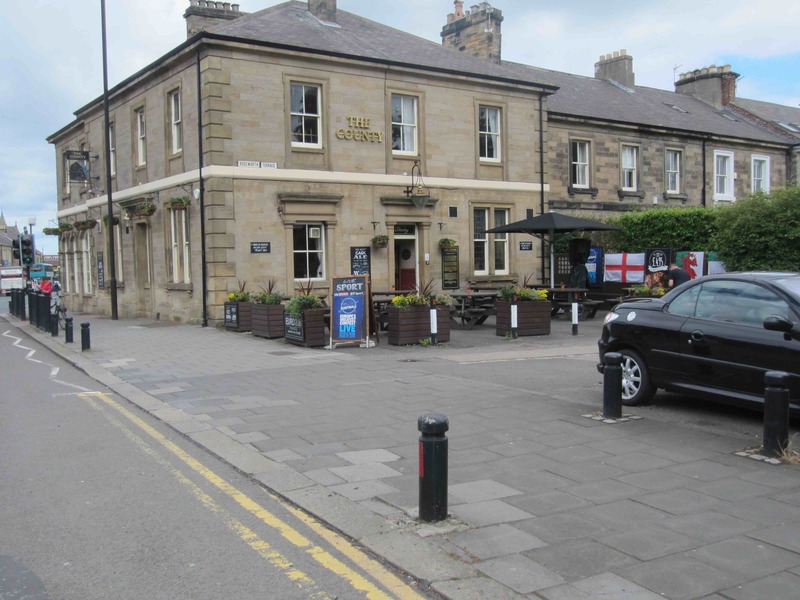 Parking – “Creating loading bays at the end of Elsdon Road”: Will object to this proposal as this will reduce further the amount of parking space in the road for residents – this being already adversely affected by businesses in the surrounding area. Thanks for commenting. We need residents of the affected roads to write in to share their thoughts. It would probably help your case if you could identify the time of day when spaces are hardest to find, as e.g. it might be possible to have some arrangement where that space (and I think it is only one) is reserved for residents when most needed but usable for loading at other times. As most of the car park on the corner of Salters Road/High Street has gone and new car parks are created dotted about here and there, is it not possible to print off a map here as to where these places are for shoppers. Otherwise there will be a lot of circling around and trying to read the signs while lookijng for a space. These look sensible suggestions but I agree with Paul that there needs to be more enforcement of existing speeding restrictions. I’d also like to see more emphasis on pedestrian crossing and double yellow lines round the Ivy Road/Salters Road junction where the new Post Office is. This has become quite a dangerous junction as cars routinely park on the faded double yellow lines and people tend to try and cross Salters Road by the shop, ignoring the old pedestrian crossing which is further up the road. I support the creation of more parking bays but perhaps a few could be for up to 3 hours? Many of the leisure activites on the High Street last for 2 hours such as the choirs and some of the craft activities at Trinity Church. 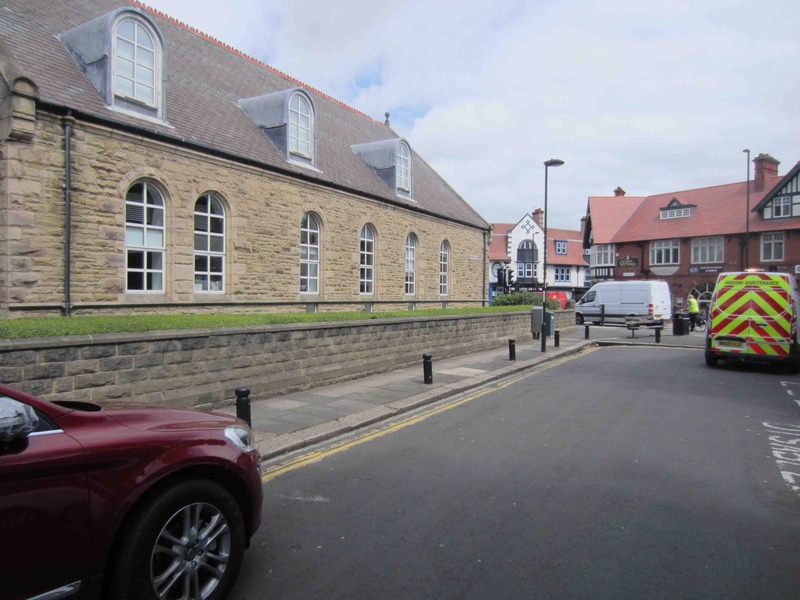 These bring business to Gosforth in different ways to simply shopping and sometimes cater for older people who may need to park and cannot walk far. On a different note – why is there only one lane going straight north at the Salters Road junction? It may seem a good idea in theory but the turn right scheme on the northbound roadway is causing massive tailbacks. Is this permanent? I’ll write to the council but thanks SPACE, keep up the good work! Thanks Julie. Please do write in with your comments. Re: the lanes. The junction change isn’t something we’ve discussed but having one straight on lane and one right-turn lane is pretty standard for traffic lights so I’m wondering if it’s just that people aren’t used to it or there is something else going on. Maybe worth waiting a few weeks to see if that makes a difference? There is only one reference to cycling that I can see. I use the High Street as a pefestrian, as an occasional dtiver, and as a daily commuter. Where are the plans to make this route safer and easier for cycling? Will the added parking bays mean we now filter in and out of the traffic to get to the cycle path that only begins south of Blue House Roundabout? Cyclsts regularly already get trapped behind the illegally-parked cars up the High Syreet proper, and northbound the putative cycle path up to Poplars is just an excuse for residents to bump up on the pavement, forcing cycles back into the main vehicular flow. Neil, I agree. The High Street needs to be made safer for everyone and that definitely includes people who want to cycle. We’ve agreed with the Council and traders to do a staged approach rather than one massive change so please keep watching and hopefully we will have something for you in the next few months. The added parking bays in this proposal are all in side streets so shouldn’t make any difference to cycling on the High Street itself. Why aren’t the number plates censored? Timothy, I’ve just updated the pictures to blank out number plates. Thanks for pointing this out. Well done. Almost a full set of pictures illustrating junctions along The High Street, but why omit the important and well-used junction – The Grove? Additionally, I find there’s an inconsistency in your positioning of Pedestrian Crossing Points. All, with the exception of The Grove have been positioned in alignment with the adjacent High Street pavements. Such positioning is vital for both pedestrians and drivers of vehicles. So why has The Grove been excluded from this norm? Bus Stops and Shelters – Any truth in the rumours going the rounds, that a number of them are to be removed? Any hope of ‘Restricted Parking’ being implemented along The Grove? If so may I suggest from High Street junction to Grove Park, be seriously concidered. 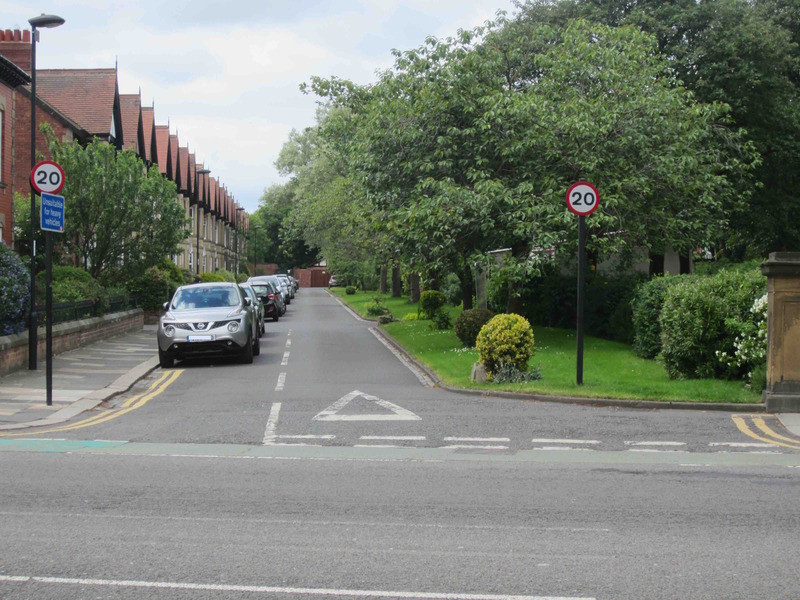 Such a scheme applies now to a section of Moor Road North, and can be classified as – being very successful. Thanks Edward, good point about missing out the Grove, it wasn’t deliberate. We’re hoping your consistency point will be addressed in the final iteration. It’s certainly something we’ve asked for. I am making an assumption here that the give way lines will be before the raised crossing exiting the side roads from the HS and on the HS side when turning into the side roads in order for full pedestrian priority to work. In all instances where pedestrians are moving onto or are already on the raised crossings, vehicles are to give way. The reality therefore will be whilst pedestrian priority is rightfully enhanced as part of this scheme, the stop start nature of polluting traffic on the soon to be single carriageway HS, will increase when pedestrian flows increase. In addition at peak times, vehicles exiting onto the HS will be caught on the raised crossings as they try to view a safe gap in traffic. So as seems to be the case with all current ‘improvements’, it helps with some aspects, but potentially creates additional issues. 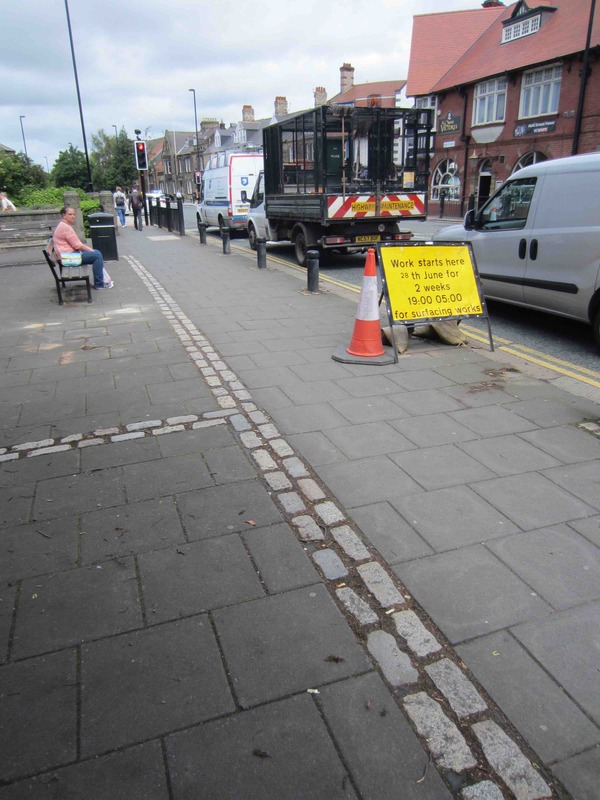 With a 20mph HS and new parking restrictions, will the on-pavement bollards be removed I wonder? One of the issues caused by the backing up of traffic on the high st is that is forcing people to find rat runs through other streets. Causes st is really busy and its compounded by the speed people fly along it. The top of causes st is pretty much one land wide and it causes real problems at the junction with linden road due to how narrow that is with the cars parked in linden road.